"Liora embodies the rare combination of extremely gifted artist and exceptionally effective teacher. Her individualistic style is reflected both in her own artwork and in the intuitive way she fosters her students. She builds confidence through her gentle and expert guidance, something I especially appreciate having had negative experiences with art classes in high school. There’s something very special about painting which has changed the way I see objects in general, making my vision much richer and more vivid. For that alone the art class would have been worthwhile. However, in addition, I enjoy expressing my creativity through painting more and more, and see my own growth. It’s amazing what the right teacher can do!" -Dr. Kathy G.
I work with each individual student at their current level, from beginner to advanced and everything in between. With extensive experience and knowledge in watercolor, oils and acrylic, I work with students of all these mediums. (beginners and those returning to painting after a while) will be given excercises that really take the pressure off while having fun and learning and improving technique, including brush control. This is a different kind of watercolor class. A fun and creative way to learn watercolor or hone your creativity and technique, using wet on wet, glazing, implied texture, etc. Individualized attention. Class will include a demo by Liora on each new technique or assignment. Advanced students choosing to work on their own projects, with coaching and critique are welcome. A relaxed atmosphere focusing on the creative process. Hone your technique, refine your eye, learn to mix your own color, and enjoy yourself! PAINTING CLASS (All or any media) Fort Lauderdale. Wednesdays at Artserve 1-4:00pm ongoing in six week sessions. A useful class for beginners and advanced painters alike. One on one attention to help develop or refine your own unique style, with attention to composition and color. An "any media" painting class focusing on acrylic and oil applications, but working with students of most 2 D media, including mixed. Individualized attention in a relaxed atmosphere. Materials list upon registration. Please register in advance. Ongoing classes, in six week sessions. Enrollment is limited. I am always happy to work with beginners or artists returning to their craft. I work with everyone from complete beginners to very advanced and accomplished painters who want feedback to get to the next levels. We work on all aspects of a painting, the drawing, composition, color, and color mixing while enjoying the creative process. available for individuals and parties as well as organizations as workshops. What a great way to celebrate a birthday! This class is designed to activate the right brain, encouraging deep creativity. Using guided visualization, aromatherapy (Young Living Oils), and other techniques to tap into our very being! People who have had little if any painting experience are amazed at what comes out when we encourage and allow it to unfold. Professional artists find it loosens them up, and brings more enjoyment and pure self expression to their art. Relaxed and nonjudgmental atmosphere. Many students have called it “Better than therapy!” All levels are welcome. For more information about this workshop, please contact me. Mandala is the sanskrit word meaning circle. It has been used in many cultures for thousands of years, including Native tribes and the Tibetans. 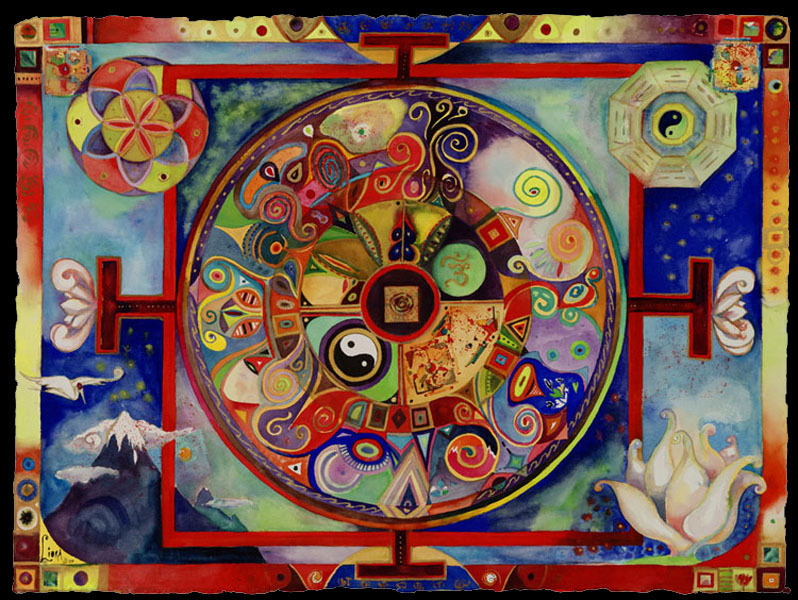 Carl Jung created a Mandala each day for many years. He felt that they were a like window to the psyche. Creating mandala is a sacred act. We invite you to join us for this informative and creative experience. This class will begin with an introduction to the Mandala as an art form and spiritual vehicle, including the history of the Mandala. We will take you on a beautiful journey into your own psyche, and from this place your mandala will spring forth. Through the use of guided meditation, essential oils, and healing music, even those who think of themselves as non creatives will be amazed at what is expressed through them! Absolutely no art experience is necessary! Group rates available for 8 or more. 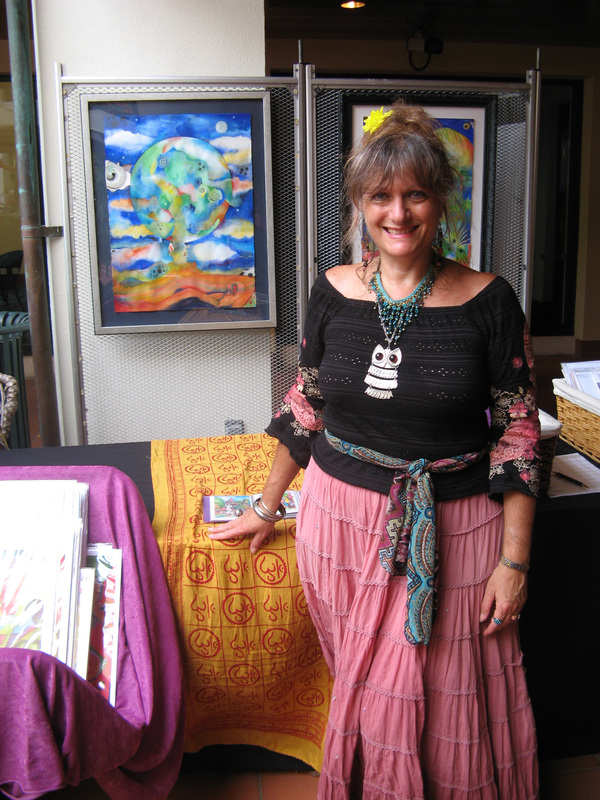 Please contact Liora for a private Mandala session or book parties or corporate events. What a great way to spend a birthday!